Read this blog to know what all changed for the industry during the last week. Mutual fund market is a roller-coaster ride which comes with several ups and downs. Should one pay heed to such market movements or not? ; this is indeed a point to ponder. Experts tell that it is much important to focus on goals instead of being cautious and panic due to market updates. However, learning about them helps one to be prepared for the upcoming challenges. Keeping the same theory in mind, we have brought you a roundup of some of the biggest stories that happened in the industry in the last week. So, let’s get started! In the week ending on July 06, 2018, major equity indices traded higher. Sensex, BSE 200, and BSE 100 were all traded up by 0.66%, 0.46%, and 0.47% while BSE Smallcap ended with a slight margin of 0.17%. Only BSE Midcap closed down by 0.38% at YTD return of -13.37%. Although on Monday, the market opened on a negative momentum because of persistent concerns over US-China trade battle and depreciating rupee value; however, later, the announcement of Minimum Support Prices (MSP) hike by Cabinet Committee on Economic Affairs and increased domestic manufacturing data improved investors’ sentiments. Rally in technology and auto stocks also benefited the market. Donald Trump levied 25% tariff on Chinese imports worth $34 billion, in return, China has levied the same tariff rate on imports amounting to $34 billion as a protectionist measure, thus signaled the upcoming trade war. 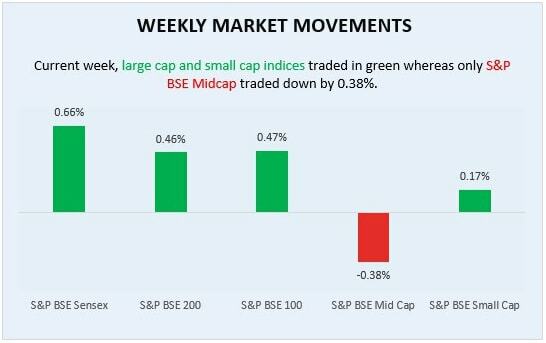 This week, many sectors traded in green with S&P BSE Auto and S&P BSE FMCG as the biggest gainers closed up by 3.62% and 1.34%, respectively. A rally in sectors including bankex, energy, healthcare, oil and gas, and consumer goods traded up by 0.45%, 0.38%, 0.30%, 0.26%, and 0.21%, respectively. Weakened rupee value brought rally in technology stocks. One of the large tech giants, TCS reached a new record high with the price of Rs. 1916.15 each share. S&P BSE Metal lost the highest, closing down by 3.40% because of the US-China trade war concerns. 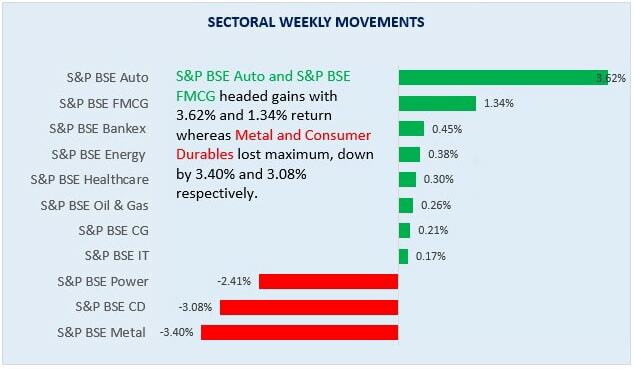 S&P BSE consumer durables lost 3.08% mainly due to lower consumers discretionary spending at higher prices. High prices of goods including air conditioner, television, washing machine, refrigerators, and others have made such products unaffordable, and as a result, many consumers have either postponed or canceled their buying decisions. Sell-offs in power sector traded market down by 2.41%. There was a bit of turbulence in the market last week. Several sectors outperformed, and there was other few who dropped drastically. We have tried to cover everything in a nutshell. To learn more about mutual fund market or seek investment guidance from the best of industry experts, connect with us at MySIPonline. For more such informative write-ups, stay tuned with us.